A wall of skulls. A black gangrenous hand. Many babies, pale as snow, slumped in glass jars. A wax arm showing the ravages of smallpox. A pair of desiccated children’s corpses, arms outstretched as if crucified. The skeletons of fetuses, some fantastically deformed — two tiny bodies sharing the same bulbous head — delicate as the bones of birds. 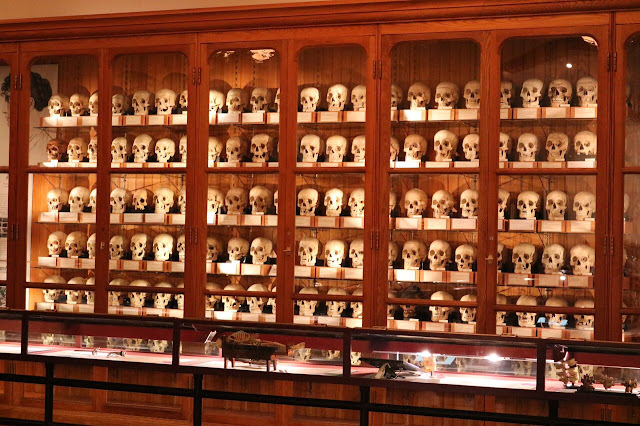 Yes, the Mutter Museum of The College of Surgeons of Philadelphia is ... ah ... challenging. But I had been to the Philadelphia Museum of Art, and the Barnes Foundation, the Museum of the Constitution and the Rodin Museum. I only had one morning free, and the Mutter is a short walk across the Schuylkill River from the Children's Hospital of Philadelphia, where I was to spend the afternoon researching a story. "This collection would not be able to be assembled today," a guide told a tour group. "With the laws we have on the books to protect folks." No kidding. Nowadays, Albert Einstein would have to agree to have his brain removed from his body. But when he died in 1955, somebody just took it, cut into segments and put on slides, a collection of which are on display at the Mutter. The gap between a medical display and a circus side show is not very wide, as evidence by the giant skeleton posed next to the dwarf's (their term). No Bearded Lady, but there is the "Soap Lady," a saponified body dug up in Philadelphia in 1875, the body fat turned into adipocere. It was something you'd pay a quarter to see behind a tent, as well as the 70-pound ovarian cyst. Or 50 cents not to see. Love these forays into weirdness. I find myself curious about the patient in the 1953 reenactment of Incan surgical technique. Not a living person, I hope? You betcha. A 31-year-old man who had a blood clot pressing on his brain. The surgery was a success. For those enamored of such displays, the Henterian Museum in London't Royal College of surgeons is worth a visit. This is why I could never be a doctor or any other kind of health care professional. The "ick factor" is too strong for me. Great line about anti-vaxxers, BTW. If you ever get back to Cleveland, I highly recommend the Dittrick Medical History Center and Museum, directly across the street from Severance Hall, the home of the Cleveland Orchestra. The history of contraception in America, changing birth practices, doctors' offices and surgical instruments of different eras, fighting diabetes and smallpox, advancements in forensics, the history of microscopes...it's all there and it's free. A great way to spend an afternoon. Best of all, the Cleveland Museum of Art, one of the world's finest, is a short walk down the street...and a lovely way to clear your head of some of the things you've just seen. @Joe H. -- That's odd, I had no problem seeing the complete column. I'm currently out of town and haven't yet seen the printed paper, but the new digital version is much improved IMO. I wonder, how long did people live in iron lungs? Google it. There are still people living in them who contracted polio in the 50s. What are you doing in Phillie? Not quite the worst place to be in the view of W.C. Fields. I like the new look of the paper and won't miss the USA today section but they forgot the table of contents in the front. This was very interesting, I would really like to visit the Mutter someday. Just one thing, are you saying that the Incas developed trephaning? I thought that dated back to Neolithic times. My father-in-law was in one for the best part of a year in 1954. It eventually killed him in 1979 at the age of 55, polio shortened many lifespans. If he knew about his antivaxxer grandson, he'd have a complete fit. As do I.